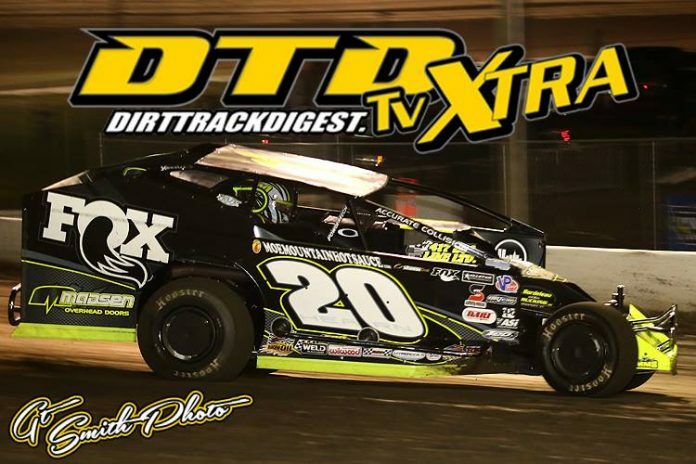 BREWERTON, NY – Since its inception in 2017, DirtTrackDigest.TV has looked to improve both the quality and frequency of events covered on the pay-per-view site. As part of that goal, DTD TV was able to reach an agreement with the Short Track Super Series to broadcast each of their events on the platform in 2019. With the addition of the STSS came the launching of Dirt Track Digest TV Xtra. The series offered an opportunity for DTD TV to test out our new scoring software as well as a multiple camera format for each event. The plans is for this format to continue moving forward at multiple events throughout 2019. DTD TV Xtra will continue for the next few events broadcast on the platform. The next event planned for broadcast is the STSS North Region opener at the Orange County Fair Speedway on Sunday, April 7. The broadcast will get the green light promptly at 3 p.m. and feature the STSS Modifieds as well as the Sportsman. Following that DTD Xtra event, the program style will continue for the kick-off for the 2019 season on the Utica-Rome Speedway with the Spring Break Shootout. The big and small-block Modifieds will be featured as well as the Sportsman and Pro Stocks. That event gets underway at 6 p.m. The plan is to produce as many DTD TV Xtra events as possible in 2019, but unfortunately not every event will be broadcast with the new system. Xtra events will be clearly marked on the sites advertising announcements as well as on DirtTrackDigest.TV prior to purchase. Anyone interested in purchasing an event can visit www.dirttrackdigest.tv for a complete list of upcoming shows. Tracks or Series looking to book an event to be broadcast on DirtTrackDigest.tv can contact mikemallett@dirttrackdigest.com for more information. About Dirt Track Digest: Dirtrackdigest.com is the number one source for big-block Modified racing news while also providing coverage of Northeast and national sprint car and late model racing. The site offers free content from award winning journalists and photographers. You can visit us online at www.dirttrackdigest.com or via the DTD App, available in the Google Play store on your Android device. If it’s on Dirt, it’s on Dirt Track Digest. DirtDigestDigest.tv is a growing source of content for live pay-per-view action of several Northeast based events including in 2019 the Short Track Super Series. DirtTrackDigest.Tv offers broadcast from a wide variety of tracks and touring series from Central New York and around the Northeast. Visit us online at www.dirttrackdigest.tv for a complete upcoming broadcasting schedule or download our App for your Roku device.